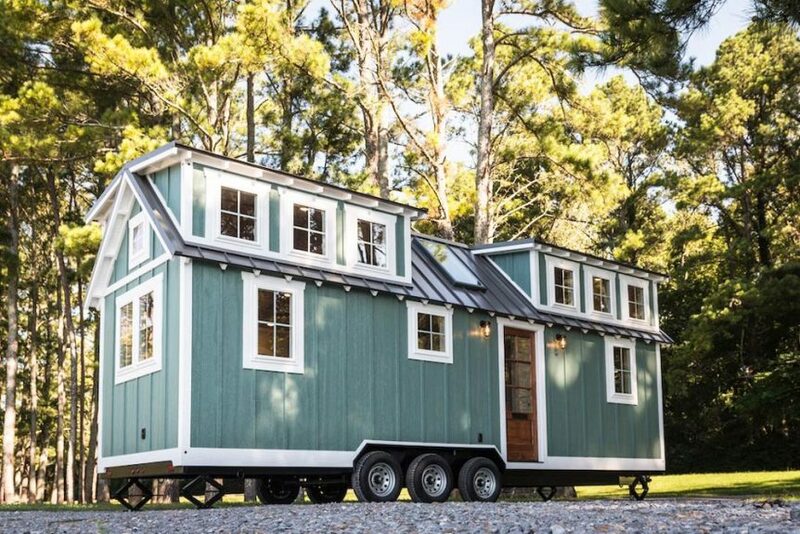 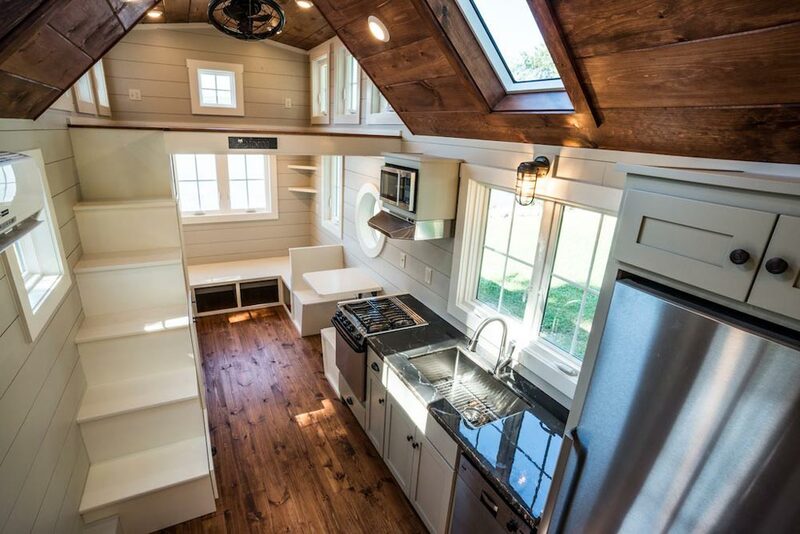 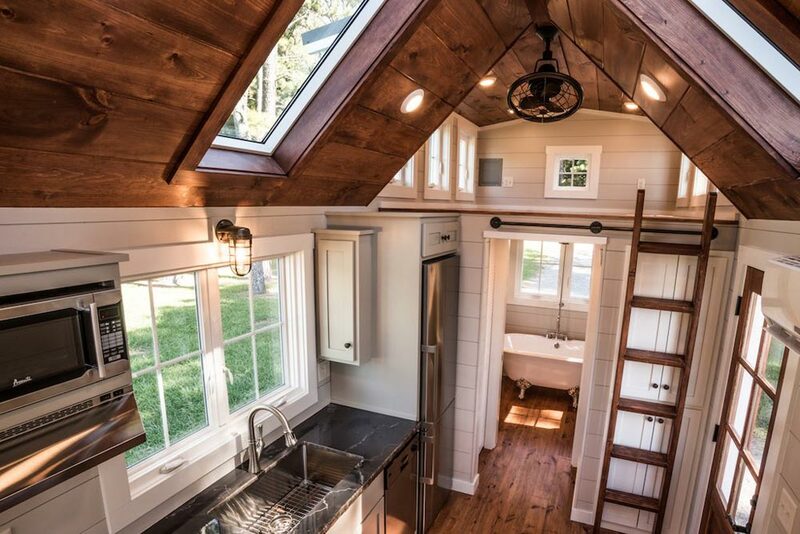 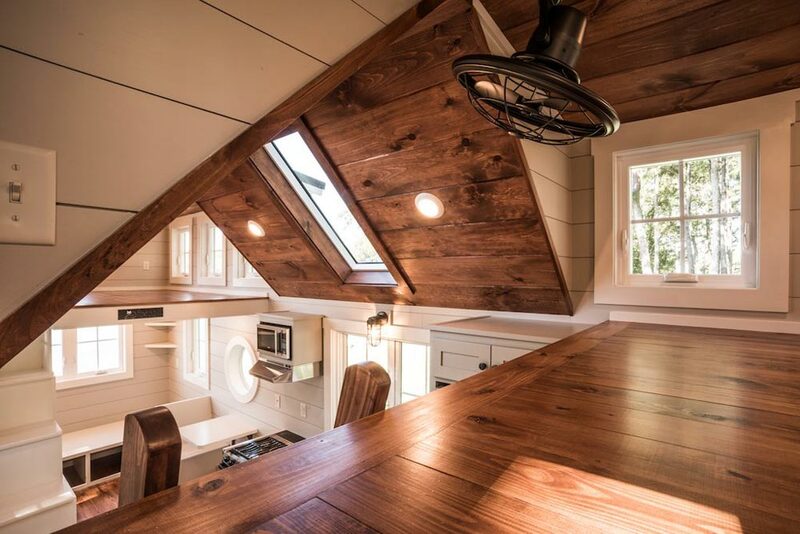 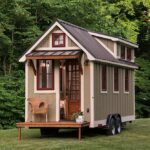 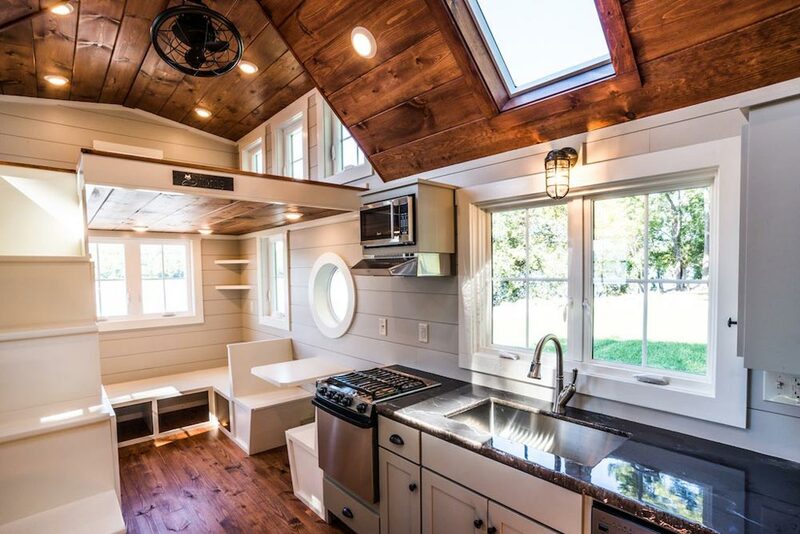 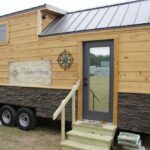 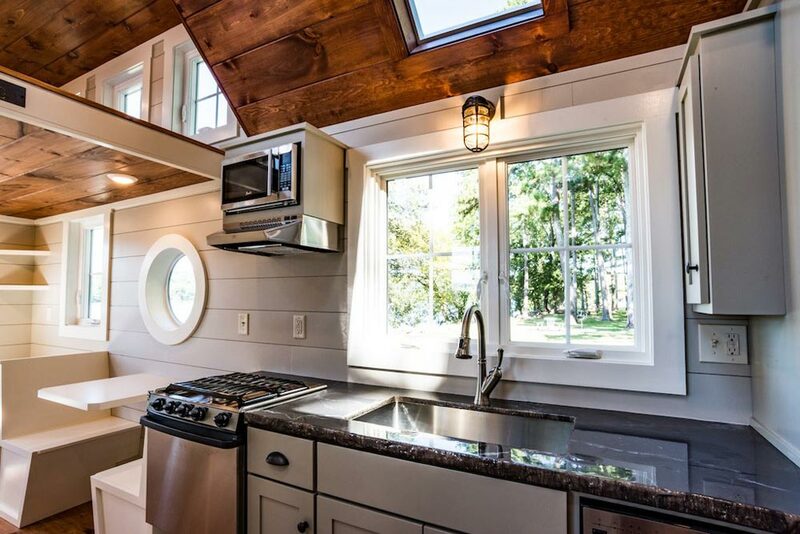 The Ridgewood is a beautiful 28′ dual-lofted tiny house by Timbercraft Tiny Homes. 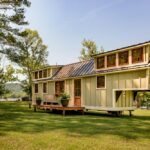 The country style home features green board-and-batten siding and exposed white rafter tails with a standing seam metal roof. 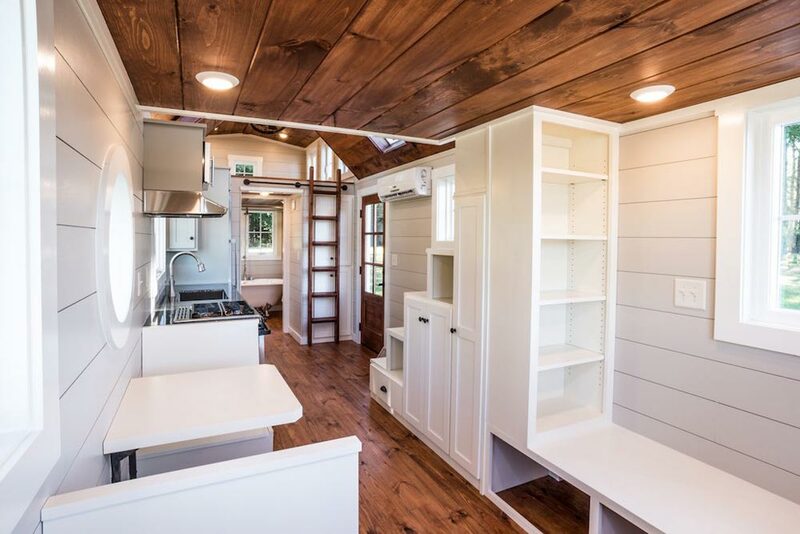 The Ridgewood’s kitchen is equipped with a custom concrete countertop, full size refrigerator, dishwasher, gas range with hood, and pantry storage. 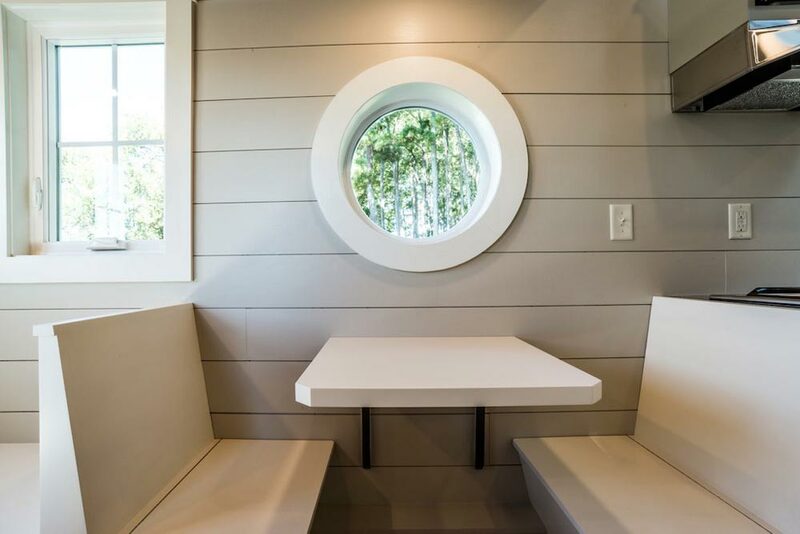 Next to the kitchen is a table with booth seats in front of a round window. 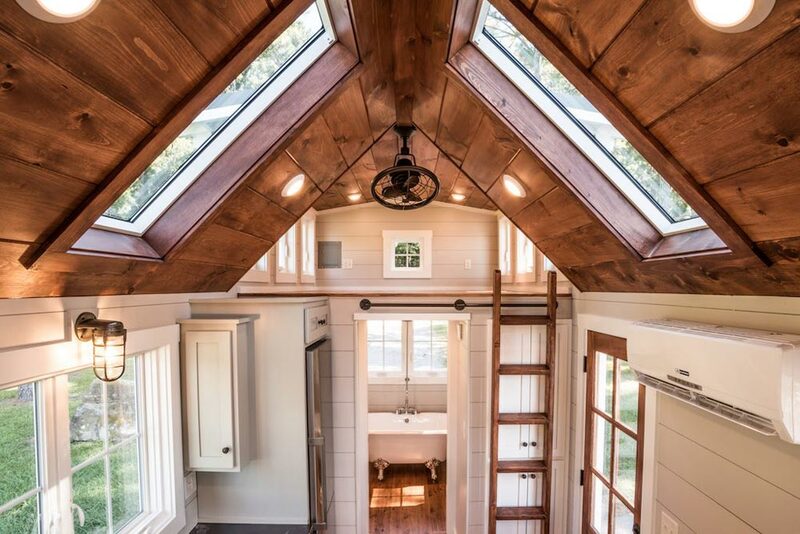 Above the main area are dual skylights. 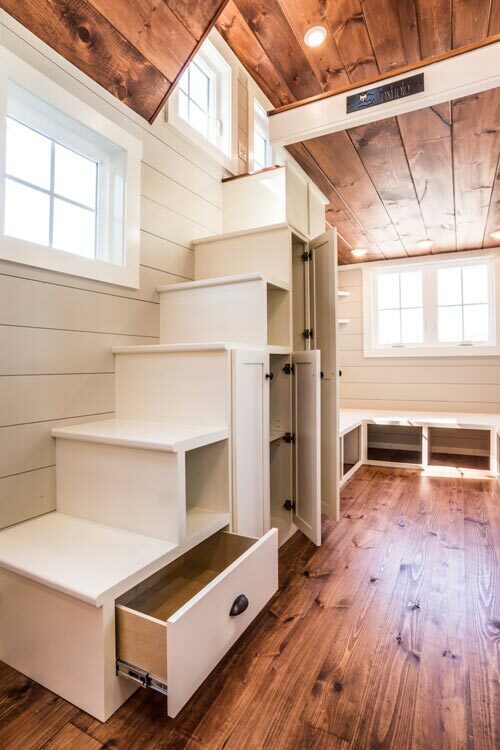 The built-in seating area in the living room is extra deep so it can be used for sleeping, plus it has storage space underneath. 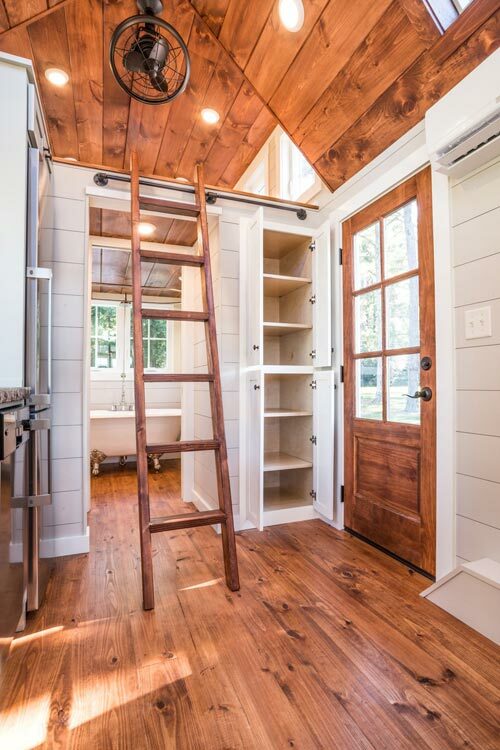 The living room also has a bookcase on the back side of the storage staircase. 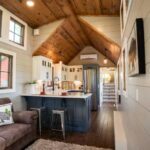 The staircase leads up to the main loft that holds a queen bed, and there is room for another queen bed in the second loft as well. 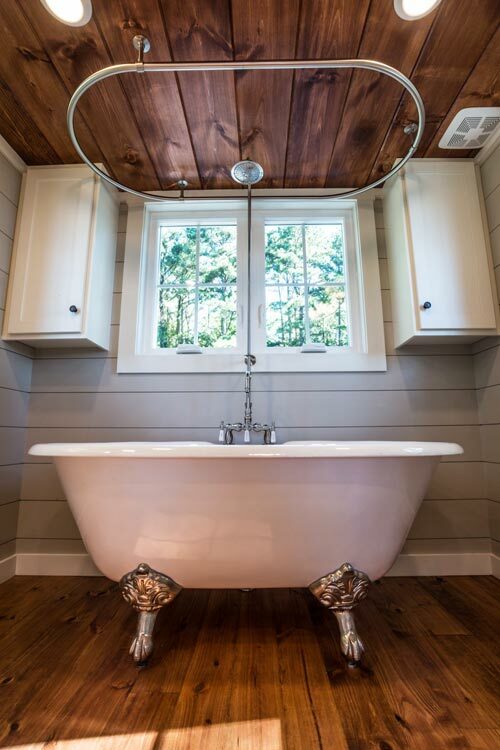 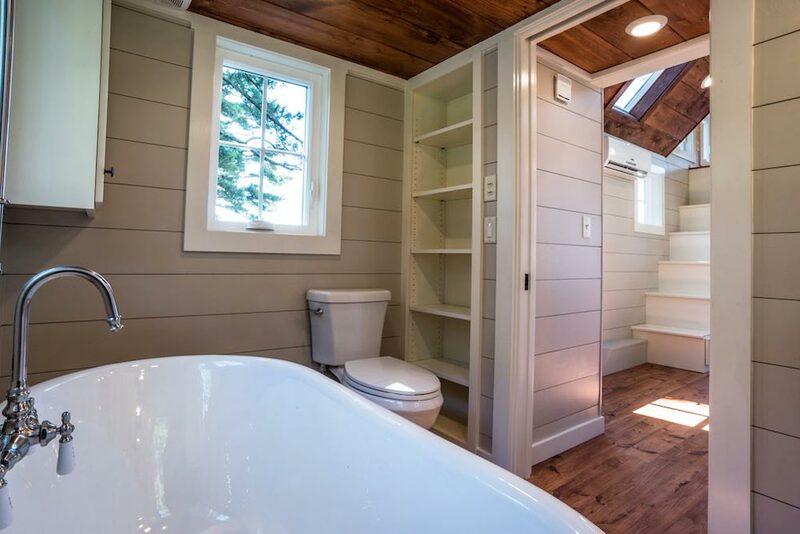 The bathroom includes a clawfoot tub with shower riser, two linen cabinets, flush toilet, linen area, corner vanity with medicine cabinet above, and a pocket door with frosted glass. 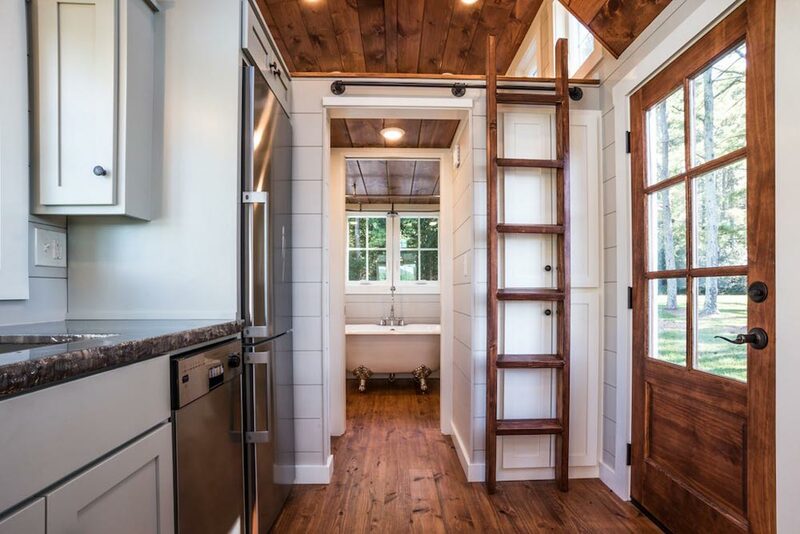 Outside the bathroom is a closet with the washer/dryer combo and a tankless water heater. 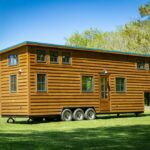 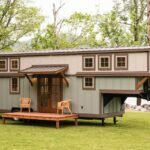 For more information, you can contact Doug Schroeder, the owner of Timbercraft Tiny Homes, through his website. 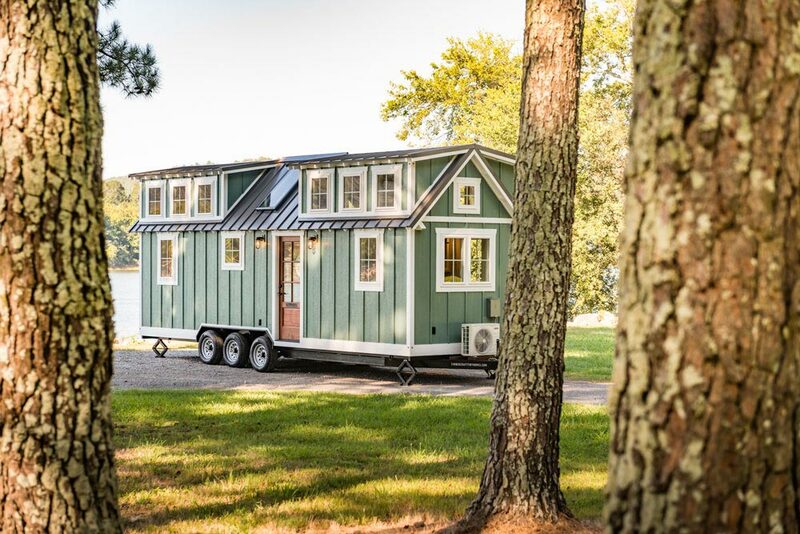 Also available from Timbercraft Tiny Homes: Boxcar, Boxcar GN, Denali, Denali XL, Retreat, Ridgewood, Ynez.